And like that, he was dead. On May 1, less than one hour before midnight, President Barack Obama announced that U.S. Special Forces had killed Osama Bin Laden, the man behind 9/11. The decade since those attacks has been a tumultuous one. TIME takes a look back. 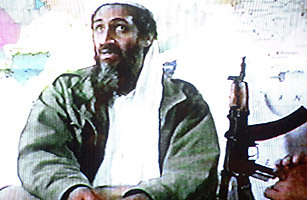 A video grab dated June 19, 2001 shows Saudi dissident Osama bin Laden in a video tape said to have been prepared and released by bin Laden himself. Nearly a decade. That's how long it took for America to achieve some measure of justice against the architect of the Sept. 11 attacks and the world's number one fugitive. In those ten years, America has launched two wars, there have been additional deadly bombings around the world, and countless soldiers and civilians of many nations have been killed. To many, Osama Bin Laden was evil incarnate, and the announcement of his death late Sunday night launched jubilant celebrations across the U.S. The details came pouring out during  and after  President Obama's White House address. Last August, U.S. officials got a bead on a Pakistani compound where Bin Laden might be staying. On April 29, just before leaving Washington to tour tornado damage in Alabama, Obama gave the OK to take him down. Bin Laden was shot at that compound in Abbottabad, Pakistan by U.S. special forces following a 40-minute raid on May 1. The soldiers took custody of his body and it's been reported that bin Laden has already been buried at sea. The end of an era, to be sure, yet history moves forward. Though the man behind 9/11 is dead, the fallout from that day  war and fear  remains.